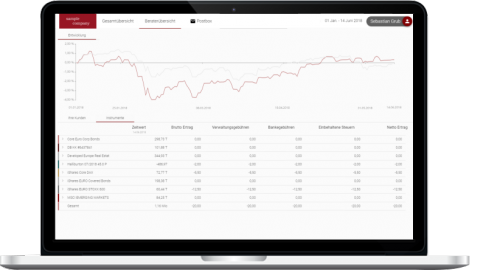 QPLIX software for investment advisors (RIAs) | Configure your demo now! QPLIX offers a SaaS software solution for (registered) investment advisors (RIAs). The software provides an automatic data connection with Thomson Reuters and a multitude of bank interfaces. While you can make use of the diverse analytics and controlling tools of the software, your clients get to experience a digital customer journey and have access to online / app portfolio data and customized reports. All three QPLIX founders have been active in the field of investment management themselves and therefore know the weaknesses of the standard processes very well. These weaknesses constitute the starting point for QPLIX. 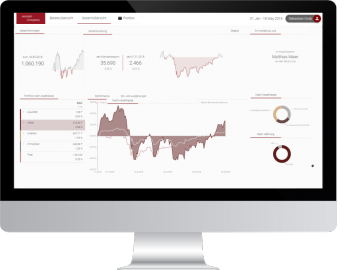 The digital client portal offers a simplified version of the QPLIX software and provides relevant digital views for investment advisors and clients. The overview, which is displayed in the portal, can be freely configured and can include different kinds of charts, tables or individual KPIs. Additionally, the portal includes a postbox, which can be used to deposit messages or reports for clients. The client portal offers an overview of all clients and investments incl. selected KPIs for asset managers. This view enables you to get a clear picture of current developments and react to changes quickly. The portal gives clients access to an interactive overview of all important KPIs and developments regarding their portfolio. This overview and its contents can easily be configured and altered by the asset manager. Offer your clients a digital user experience, by managing portfolios with our web platform and giving access to them via client portal or smartphone app. The digital exchange of reports and messages supports you in your customer communication activities. Profit from the numerous data interfaces, which have been established in QPLIX. While market data can automatically be retrieved from Thomson Reuters, cashflows and transaction data can be imported via different available bank interfaces. QPLIX helps you to standardize many processes (e.g. administration, reporting, billing, loss thresholding etc. ), while your clients are still part of a customized user experience and individual care. In focus: QPLIX is MiFID ll compliant and supports you in optimally adapting your processes to the regulations. Configure the hypothetical asset structure for your personal demo now.